Tired of chasing symptoms and being stressed? Want to get at the root of your challenges, for lasting change? Help your body do what its already instinctively trying to do – Be YOU! This gentle, light-touch bodywork helps you relax deeply and re-set your over-worked nervous system from survival/stressed mode to thriving/healthful/joyful mode. Quality of life and fulfillment can then become a priorities. It works with your innate self corrective systems using light holds (not the stroking and kneading of massage – so it has few precautions). It can be easily done fully clothed. 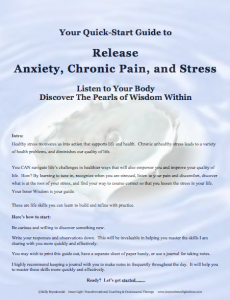 It helps release even long-held patterns of tension in layers, like peeling an onion, so that your system isn’t again overwhelmed, and you get to the core of your issues – your “pearl”, or silver lining. Unfinished business can be re-visited, and addressed by releasing obsolete patterns of stress, pain, and tension. New patterns of health and well-being can be created in body, mind, and spirit as your nervous system is supported in doing what it is designed to do – Be YOU!. Its about BEING better, not just feeling better. Sound good? Want to know more? Check out the FAQ’s. If you’d like to discuss how this powerful work may make THE difference in your life, let’s hop on the phone for a complimentary consultation. Call me today: (315) 868-1722.